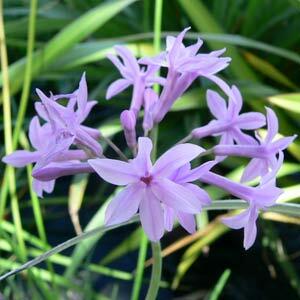 With attractive foliage and great flowers as well, Tulbaghia violacea the plant we commonly call ‘Society Garlic’ is mostly grown as an ornamental plant, although it is edible as well. The foliage is an attractive green strap like and will reach around 30 cm in height. 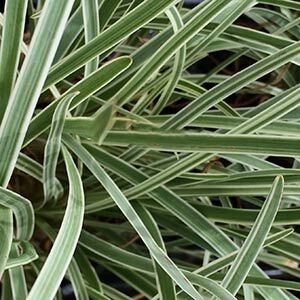 The variegated form is becoming very popular, with its green and yellow foliage adding an extra dimension. This is an evergreen perennial, drought tolerant, frost tolerant and able to grow well in poor soils. It is the leaves that give it the common name of ‘Society Garlic’, they can be used to add a slight ‘garlic’ flavour in cooking, without what was seen as the ‘unsociable’ garlic odour. An interesting plant, also known as Chinese Chives it is easy to grow like most of its relatives. It is one of those ‘dual purpose plants’ grown for its pretty purple flowers as well as a cut and eat plant used widely in Asian dishes especially stir fries. Excellent in the rock garden, grown in the garden border or in containers. Very useful in the garden for planting in clumps in the border, as an edging plant, or simply as a plant for the herb or kitchen garden. A few cultivars are listed, however not all are available for sale, or are at least difficult to find in Australia including Tulbaghia Violacea John Rider . Tulbaghia violacea ‘John May’s Special’ which is a taller growing form. 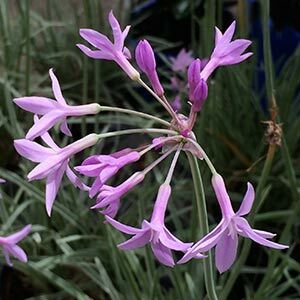 Tulbaghia simmleri – Also known as Tulbaghia fragrans and two forms are available, a white flowering form and a pale pink form, both will reach around 50 cm in height and are winter flowering. Best grown in full sun to part shade in a humus rich well drained soil. You can deadhead to improve appearance in the garden and remember to divide clumps every 3 – 4 years as they become crowded. This is also a good time to replenish the soil by digging in some well rotted compost. Spread – Forms a clump to 30cm over time. Easy by division of established clumps, and recommended every 3 years to maintain vigour and good flowering. Best time to divide is in spring.